Rockman Corner: Is There Any Hope For Powered Up on PlayStation Network? Is There Any Hope For Powered Up on PlayStation Network? A couple years ago, we learned Capcom and Sony couldn't get Mega Man Powered Up on the PlayStation Network because of technical difficulties. “There are technical problems that neither we or Sony are able to get around. The game doesn’t run properly when put in digital form. So it’s physical only for the time being (hold onto those UMDs, they’re gonna be valuable)," shared Capcom's Christian Svensson. "Funny you should ask as I just raised this in our digital sales meeting on Monday. I have in my possession, the two rejection letters from SCEE and SCEA about the digital versions of the game Sony made hanging at the title screen on PSP back in some older version of the firmware. With Vita out and several PSP firmware revisions since then, we're going to reengage with Sony again and see if anything has changed. No promises as it's not in our hands. :/ "
Keep those fingers crossed, friends! If all goes well, we may yet see Powered Up on PSN. wait, so the game's title screen was the problem? That's odd. I've never had any problems running my unaltered ISO dump of Rockman Rockman on any firmware version of the PSP (official versions aside, for obvious reasons). I can't help but wonder why it would fail to load on the PSP Vita... Is the chipper game title announcement too intense for the Vita to handle? I don't know what BS Sony or Capcom is pulling. The only "technical difficulty is something they just don't want to share. I've never owned a UMD of Powered Up and I've played it multiple times on my PSP. I bought MHX near launch, but I can say with absolution that game runs "digitally", no problem. Here's hoping. Also hoping MM6, 7 and X3 show up on the Wii VC soon. All I care is next sequels. I really hope this game can become available in the US PSN. That being said, it is kinda suprising they are not able to get a game like this in "digital" form. It is available in the Japanese PSN, so why not the US? I am not going to get my hopes up, but nothing's impossible. Even with this, I would buy the game if launched for PS3/PSN, as playing in joystick would be much better than on handheld. I have to say, that sounds like typical capcom and sony of america bs to me. if the game has trouble running then why is it on the japan psn? 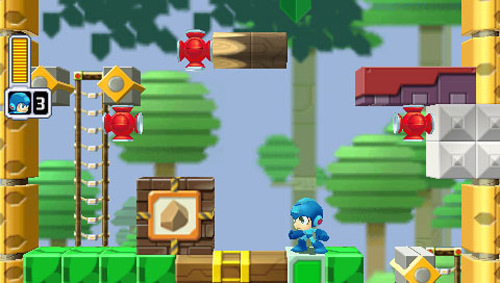 not to mention irregular hunter rockman x and rockman dash 1-2 are both on the japan psn. but is it really that big of a deal for powered up? the game is still very easy to find in physical form and I don't really ever see it as being hard to find in the near future. I'm just waiting for the rest of the complete works series to be released already in the ps1 classics section, their still missing mm5 and 6. also why not release both the mm aniversarry collection and mmx collection in the ps2 section? MM5 Complete Works is already on Japanese PSN as well just waiting on MM6 now..
Am I the only one who doesn't like Powered Up and rather it stay completely dead? Seriously, out of all the Megaman games I don't like, Powered Up tops my list, being even above Star Force games and the other bad spin off titles. That is how much I dislike this game. It sounds a little too late to me. The PSP is going to bite the dust soon and MMPU is from what, 2006? Also, the game's sales record might have something to do with the 'technical difficulty' a.k.a. it probably sold so badly that they don't even think it's worth it to put on PSN, and whenever someone asks about it they just stall.